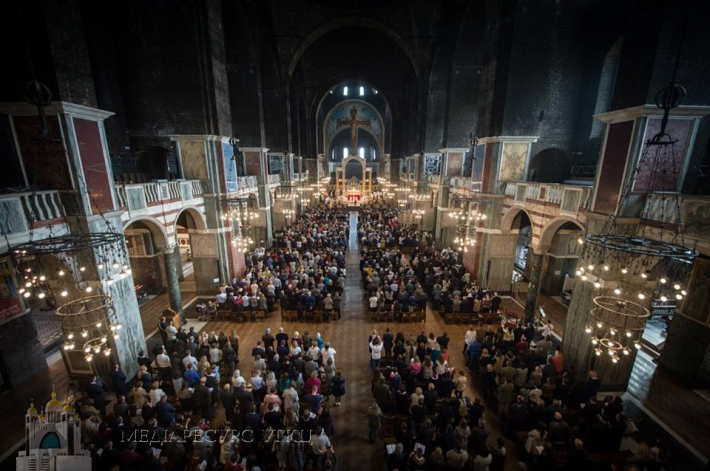 London (risu.org.ua) - On the afternoon of Saturday 28th October 2017, over one thousand faithful descended on London to witness an historic occasion – the celebration of an Eastern Rite Liturgy – at Westminster Cathedral, the Mother Church for Catholics in England and Wales. His Beatitude Patriarch Sviatoslav, Father and Head of the Ukrainian Catholic Church, along with Eastern Catholic Bishops of Europe and members of the Catholic Bishops’ Conference of England and Wales celebrated the Pontifical Divine Liturgy in the presence of His Eminence Cardinal Vincent Nichols and the Most Reverend Edward Joseph Adams, Apostolic Nuncio to Great Britain. Also in attendance at the Hierarchical service to commemorate the 60th anniversary of the establishment of the Ukrainian Catholic Exarchate/Eparchy were representatives of the Anglican and Orthodox Churches.